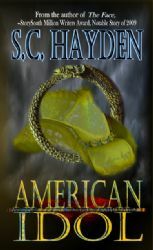 Writer S.C. Hayden, whose fascinating short story "End Day" was a highlight of M-Brane SF #3 two years ago, has had a string of publications since, and his new novel, American Idol, is just out from Black Bed Sheet Books. Hayden describes it as a dark social satire that takes some swipes at religion, consumerism, and politics. In a twisted yet somehow familiar version of America where militias, doomsday cults and self proclaimed Prophets are as commonplace as gas stations and fast food restaurants, The American Idol Company is born. Their goal: resurrect Idolatry as a prominent religion and get rich manufacturing and selling Idols. They publicly promote their fledgling company as if it were a legitimate religion and they themselves Prophets. The company becomes quickly and wildly successful but outrages millions across the country and around the world. Operating under the belief that scandal and controversy will increase sales, Augustus and Desmond manage to insult everyone from the Pope to the Ayatollah, and come dangerously close to starting World War 3. Meanwhile, a shadowy group of religious fundamentalists manipulate a naive young man named Robert General. Robert, a repressed homosexual and member of the Sweethaven Chapter of the Righteous American Nazis, is used as a pawn in a plot to destroy The American Idol Company. The looming threat of disaster comes to fruition in the city of Galapagos, Texas, when Rob General, confused and drug-addled, flies a small ,explosive laden airplane into The American Idol Company headquarters. I have only read the first four chapters of this book, and so I cannot provide an actual review of it. But Hayden is a good writer with an engaging style. 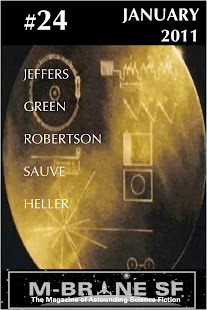 Very often, satirical speculative fiction that trades heavily in contemporary situations does not appeal to me because it is often too contemporaneous, too self-consciously about current affairs and often quite blunt in an inartful way. But I am not finding this to be the case at all with Hayden's book a few chapters in. Readers who are into this kind of story ought to check it out. It's also available at Amazon. By the way, I like to offer plugs for M-Brane writers when they have a new book out, but I have probably missed a lot of such opportunities. So if you are a writer whom I've published in M-Brane SF or in one of our anthologies, and would like a shout-out for your current work, do let me know at mbranesf at gmail dot com. I cannot promise reviews because reading time is so precious nowadays but I'll do my best to help get the word out.